We have a wide variety or Retro 51 pens and pencils in stock here and we’d love to help you choose just the perfect one. The image shows just a sample of the ones we have available. There are beautiful pens like the Cioppino made from seashells and there are some that just make you happy like Buzz (the honey bee pen). We have pencils that are educational such as Dimitri featuring the periodic table and the Dino pen (you can feel his bones). The Retro pens feature a knurled twist top to extract and retract the pen refill. The roller ball pens come with the smooth writing P8126 roller refill and the ball points come with the hybrid Parker-style refill. The pencils feature a 1.15 lead – which holds up very well under a heavy hand – and they come with spare leads and erasers. It’s never too early to start thinking about the upcoming gift-giving season and we have the write gift for everyone on your list. 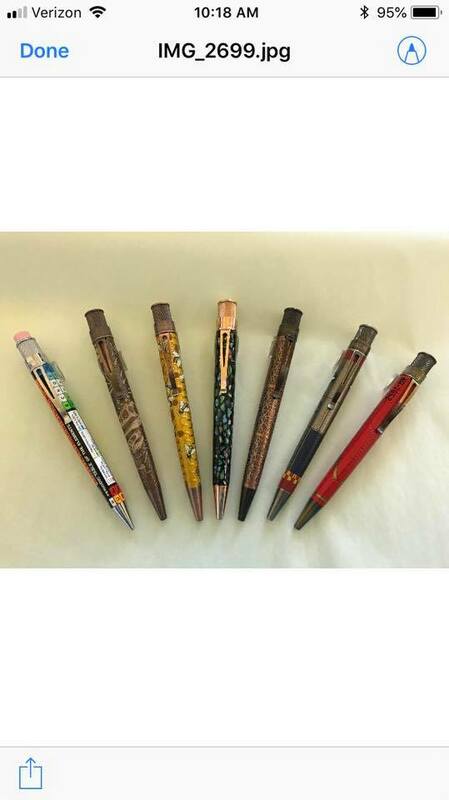 The Retro 51 pens and pencils would make a perfect gift for any special occasion; birthday, Christmas, Hanukkah, etc. Or just make someone’s day special with the thoughtful gift of a great writing instrument for no reason at all other than “I was just thinking of you”. And of course these writing instruments are refillable!